We’ve compiled some of the documentation coming out of the Detroit Digital Justice Coalition‘s last DiscoTech (Discovering Technology Fair). Dig through this exciting collection of DiscoTech video, audio documentary, articles, and photos. Also, get ready because we are doing it again: the next DiscoTech will be held April 15, 1:00 p.m. – 4:00 p.m. at the Museum of Contemporary Art Detroit (MOCAD), 4454 Woodward Ave.
Detroit Future Media alumni Patrick Geans and Mike Polk worked with DFM Program Coordinator Imad Hassan to produce a sharp video recap of the DiscoTech which was held February 26 at the the Mt. Elliott Makerspace in the Church of the Messiah on Detroit’s eastside. Jennifer Guerra produced an excellent radio segment on how Discotech uses technology to foster community. The segment was broadcast on Michigan Radio (91.7 FM Ann Arbor/Detroit). Listen here. DiscoTechs are not only innovative in their goal to maximize and expand Detroiters’ technological skills, but also in their structure. The fairs are organized with separate “stations” in a large room led by volunteers with expertise in different technologies and their applications. At the most recent DiscoTech, participants learned how to make stencils, use social media, and disassemble a desktop hard drive. In a corner of the room, participants watched and discussed The Internet Is Serious Business, a documentary produced in 2008 by the People’s Production House and Center for Urban Pedagogy, about the technologies and policies that shape the Internet. At another table, two volunteers hosted a consultation station on privacy and answered questions about how to protect yourself online. The DiscoTech offers a vision of the city where people of color are encouraged to engage in technology on their own terms. The inter-generational room of mostly Black Detroit residents painted a stark contrast to the sobering statistics around the digital divide. Rather than allow themselves to be seen as victims of federal communication policies that limit their digital participation — or as passive recipients of more recent digital inclusion policies which can be alienating or condescending — people of color at the DiscoTech actively armed themselves with the technical skills to ensure they won’t be left behind in the digital age. At one station, a 10-year-old girl taught an elder how to solder electronic components to a circuit board. Read the full blog post at the Open Technology Initiative. Last Sunday afternoon [Feb. 26], I watched the future take shape. I went to the third DiscoTech, put together by the Digital Justice Coalition. DiscoTech is short for Discovering Technology Fair. The fair includes more than a dozen hands-on stations where people can learn everything from how to set up an e-mail account to how to fix a computer. …[T]he fair attracted hundreds of people, mostly young, and all engaged. The first thing I saw when I entered the bustling room was a group of young men working on windmills. Like everyone else, they were completely engrossed in their projects, testing out their design and construction of the blades. Just past the windmills there was a table crowded with people. The table was heaped with blinking LED lights. Before long, it became clear the lights were being soldered to small battery discs, creating powered jewelry. The creators were mostly young women, learning about electricity, battery power and soldering irons. Over the course of the afternoon, most people managed to get a pin or two for shirts and caps. In a far corner of the room, another group gathered to watch and discuss a short film called “The Internet is Serious Business.” The film gives people a good sense of what the Internet really is and the issues communities face in using it for positive change. Read the full column in the Michigan Citizen. Nina Bianchi has a collection of photos and video from the DiscoTech here. 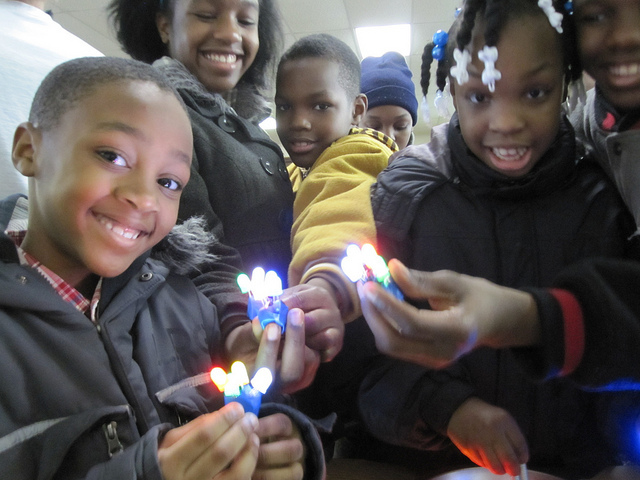 "DiscoTech uses technology to foster community"
By Jennifer Guerra for Michigan Radio. It’s a traveling technology workshop that looks a lot like a pop-up science fair, with laptops, poster boards, wires and circuits all around the room. Google apps, windmills and soldering…oh my! 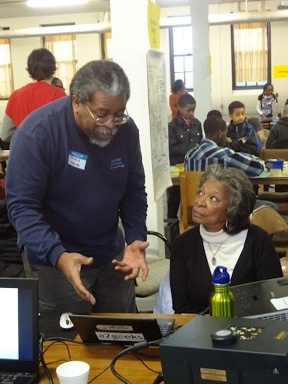 Nucera’s group, the Detroit Digital Justice Coalition, has opened 13 public computing labs around the city to help fill the gap left by shuttered libraries, and they throw these discotechs a few times a year at the various labs – each one a little different than the last. The most recent discotech was at the Mt. Elliott Makerspace, which is located in the basement of the Church of the Messiah on Detroit’s eastside. For more than 20 years, Walton has lived on Detroit’s east side, one of the most violent parts of the city. She says often, she and her neighbors feel “abandoned” by the city. Walton calls herself and her neighbors “quiet foot soldiers” – they’re working hard to keep their little corner of the city clean and safe. "Digital Justice and Our Future"
Originally published Sunday March 2, 2012 in the Michigan Citizen. Last Sunday afternoon [Feb. 26], I watched the future take shape. I went to the third DiscoTech, put together by the Digital Justice Coalition. DiscoTech is short for Discovering Technology Fair. The fair includes more than a dozen hands-on stations where people can learn everything from how to set up an e-mail account to how to fix a computer. Held at the Makerspace at the Church of the Messiah, 231 E. Grand Blvd., the fair attracted hundreds of people, mostly young, and all engaged. In a far corner of the room, another group gathered to watch and discuss a short film called “The Internet is Serious Business.” The film gives people a good sense of what the Internet really is and the issues communities face in using it for positive change. You can check it out at www.vimeo.com/13830730. The Digital Justice Coalition will work with you if you want to arrange a screening and discussion. The center of the room was dominated by three bicycles brought by the East Side Riders. They use materials reclaimed from old couches to refashion bikes, using battery power to run lights and sound, custom-designed by and for the rider. On any given weekend as many as 400 folks ride the streets, offering a new vision of travel in the motor city. Next to me was an older woman learning about Gmail (Google’s e-mail service). Everywhere you looked, people were in small clusters, talking, looking, doing, imagining. As impressive as I found each station, the overall buzz was what really amazed me. There were hundreds of people moving through the space, but no one was “in charge.” No one was telling people where to go or what to do. Although I heard lots of laughter, I never heard a raised voice or a directive. Other than the use of a microphone for the raffle, the whole experience flowed from an internal, organic logic. Through their efforts, Detroit is creating a new grassroots web of imaginative, collaborative and more just possibilities for our future.